It’s the final party of Paris Fashion Week, and the scene is extra fancy in the VIP. Kanye West just presented the runway show for his 2012 autumn/winter women’s-wear collection, drawing a celebrity swarm: Musicians (Diddy! Alicia Keys! ), actors (Rosario Dawson! ), models (Joan Smalls! ), reality-TV stars (Kim Kardashian! ), assorted socialites, marquee fashion editors, and plus-ones are all velvet-roped into a corner of an airplane-hangar-size warehouse. Swathed in furs and stilettos and jewels and importance, they sip hand-delivered flutes of champagne. Hapless cameramen worm into the spectacle, hoping for a shot of Kanye with Kim, but everyone else wants to be seen, too, and they’re holding their best sides aloft, just in case. 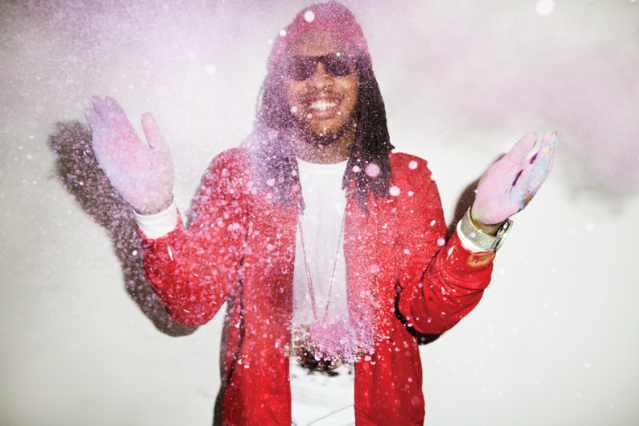 Everyone, that is, but Waka Flocka Flame. Dreaded up and unassuming in a pristine black T-shirt, the rapper is tonight’s featured performer, summoned by Kanye at the last possible minute to fly in from his home outside Atlanta. But Waka Flocka Flame is nowhere near the VIP, which he breaches only twice, once on his way to a loading dock where he sparks up a scavenged blunt. Waka Flocka Flame is mostly interested in talking to the coat-check girls. In a dark cove at the back of the venue, he jokes with two enraptured, giggling Parisians who are trying to teach him French words, gazing up at the friendly, six-foot-five ATLien. By the time he heads toward the stage — which is decorated like a Mayan temple and looms above the crowd — the girls are handing him free bottles of Evian, hearts throbbing from their eyes. How did Waka get so loud? Trace his life story in photos. Harlem-raised spitfire Azealia Banks and Kanye’s pop-rap protégé Big Sean already have performed, to mixed results, and the masses are emitting a stuffiness that suggests they’re more concerned with not scuffing the soles of their shoes. Waka ambles up the steps to the DJ booth where Kanye’s DJ sidekick A-Trak, wearing a Lanvin leather jacket, plays cuts from his boss’ Late Registration. A handful of partygoers assemble along the front of the stage, seemingly aware of what’s about to go down, but when that unmistakably hulking, skittering beat drops, and Waka scream-growls his most indelible lyric — “I go hard in da muthafuckin’ paint!” — the warehouse suddenly transforms into a live conduit for the rapper’s uncontainable electricity. 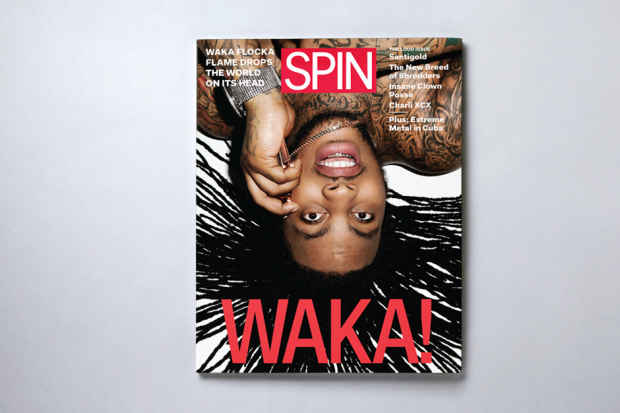 See Waka Flocka Flame’s SPIN cover shoot. Waka is at a crucial point in his career; he’s not yet acclimated to the trappings of success — the free Bulgari shampoo in his hotel room leaves him incredulous — but he’s apparently on a path toward mega-something. In the three years since his first mixtape, Salute Me or Shoot Me, he’s become America’s go-to soundtrack for cranked-up parties, barking rowdy lyrics over chassis-shaking beats. “O Let’s Do It,” his 2009 debut single, was an instant hit on the streets and in the clubs, with Waka’s punchy drawl rolling through the minimal synth horns like a guttural counter-rhythm. His 2009 debut album, Flockaveli, has moved more than 300,000 units (plus countless illegal downloads) and has christened “Waka Flocka Flame” as a larger-than-life pop-culture character. Working with Lexus Lewis, the young Virginian known as Lex Luger — who produced 11 of Flockaveli’s 17 songs (including singles “Hard in Da Paint” and “Grove St. Party”) — he’s also created an immediately identifiable sound: an ominous collision of warrior synths and overarching rowdiness that, above all, is unremittingly loud.